Marketing can be exciting and engaging, we look at 10 of the Smartest Outdoor Marketing Campaigns we have come across! For the launch of Netflix in France, Ogilvy Paris created 100 different GIFs and installed them on outdoor boards. They’re undeniably eye-catching in ways other digital video just isn’t. The GIF’s and messages shown reacted live within two hours to topical events and breaking news, adapting the message around it. A very clever ad in Sweden on the subway for a hair-care line of products was rigged up to recognise when trains entered the station, blowing the models hair all around in the gust of wind. Simple, fun, playful, and responsive, blurring the line wonderfully between the real and virtual worlds. Kit Kat ran a very clever billboard campaign based on their famous tagline “Have a break, have a Kit Kat” dating to 1958. 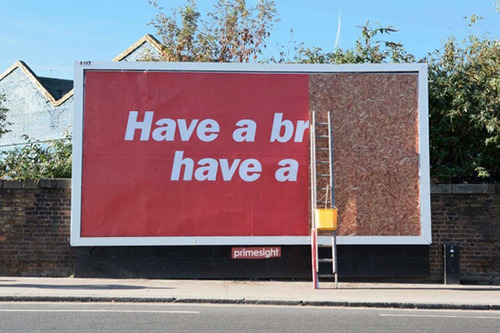 The billboard message and brand is instantly recognisable with only half the message showing and no logo, very smart Kit Kat! In 2013, Westjet made a Christmas miracle happen for more than 250 guests on two Calgary-bound flights. As guests boarded their flight, an interactive santa on a screen asked each passenger what they would like for Christmas. Passengers engaged and had fun with the prop, probably thinking nothing more of it. However, upon touch down, the luggage collection was filled with alot more than the bags they started their journey with. For a few lucky customers in Canada, one bank’s special ATM dispensed a lot more than cash;tissues at the ready for this one! As part of it’s “TD Thanks You” marketing campaign, TD Canada Trust suprised some loyal customers with everything from bonus cash to gifts including a bouquet of flowers to a team shirt and cap for a Toronto Blue Jays fan, college money for one woman’s kids and a trip to Disney. In one of the most touching moments, a woman named Dorothy received tickets to Trinidad to visit her daughter who had undergone a recent cancer surgery. When theTNT network launched in Belgium, they chose a normally quiet square in which to do so. They curiously placed a large arrow that said “Push to add drama,” next to a large red button on a podium and waited for it all to kick off. It didn’t take long for someone to give in to curiosity and well, see for yourself. Historically, billboard ads are an eyesore, visual noise to distract you with marketing messages and not very useful. 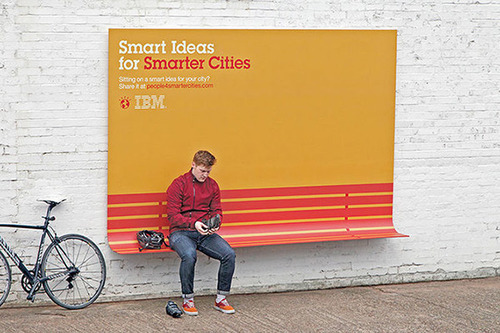 IBM’s campaign changed that using the billboards for two-fold purposes making them “useful billboards”. One sign doubles as a bench, while another as a rain shelter. It’s simple, clever design and effective… caught our attention! We love this one. An electronic sign on the street, where people call out to passing loved ones to give them a thank you message, placing a kiss on the tissue and then placing it below the screen, a “kissed” pack of Kleenex then appears for the recipient. Very cute Kleenex! In 2014, ABC chose to promote the Walking Dead Season five in New York by placing a hoard of zombies beneath a grate on a New York sidewalk, left to reach up to unsuspecting passersby. The final result was highly entertaining and at least the zombies were nice enough not to scare one curious little girl. In 2014, when Pepsi took over a bus shelter in London’s New Oxford Street, commuters were in for a fun suprise. Augmented Reality was used to give them an out of the ordinary “unbelievable” experience, in line with the brand’s personality and tag line for Pepsi Max “Maximum taste-no sugar-unbelievable”. The campaign video went viral on YouTube, making it one of YouTube’s most viewed advertising campaigns.